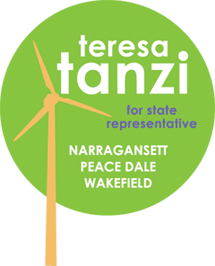 State Rep. David Caprio of Narragansett is facing an aggressive challenge from political newcomer Teresa Tanzi of Wakefield in the Democratic primary for House District 34, which includes southern Narragansett, Peace Dale and Wakefield. Caprio, who was elected in 1999 in a special election, stands by his record of accomplishments in the General Assembly. Tanzi touts herself as a mother, neighbor and advocate and says she will bring new blood and a political renaissance to Smith Hill. Tanzi, married and mother to 4-year-old daughter Delia, said her modest background has shaped her campaign. She is a first-generation Italian-American who wore homemade clothes as a child and attended public school. Originally from New Jersey, Tanzi spent 20 years in the Garden State before relocating to Utah, where she worked to construct affordable artist housing in Salt Lake City. She is vice chairwoman of the Broad Rock Community Garden, a Jonnycake Center Hunger Task Force member and a Friend of Canonchet Farm. "My true work has always been my volunteer work, and that keeps me deeply rooted in the community," she said. Tanzi said that she does not see her opponent in local restaurants or grocery stores. "I think he's lost that connection with the people," she said. "I am in constant contact with the local business owners. I'm friends with them because I'm usually there." She said that she is a voice for the people in a district she feels is sorely lacking one. "If you want to try to break the mold and break this hold that the connected individuals have on this state, then you've got to support me," she said. Tanzi alleged that the legislation was passed only to change perception. "It's like a sleight of hand to say, 'We did this, we didn't raise any taxes, we've completely reformed the tax system, and yet the outcome is absolutely no different.' " She said she has lobbied to repeal the state's alternative flat tax, and that tax reform did nothing more than solidify it into law, ... saying, "I look at it as the biggest squandered opportunity of the General Assembly in the last 25 years." District and state residents have voiced concern over spending budget deficits this election season. Tanzi said she thinks that while much attention is given to the spending side of the budget, the revenue side is sometimes ignored. "The concept of cutting our way out of the budget crisis and leaving people more vulnerable because of these cuts, it's very frustrating," she said. She also stands firmly behind her belief that the state's expenditure report needs to be examined in looking for ways to close the budget gap. "It needs to be analyzed. It's absolutely ridiculous that it's not analyzed," she said. Both candidates voiced their support for the fishermen in Galilee, where government regulations and financial hardships have weakened the industry. Tanzi also voiced her support for fishermen within her district. "I feel that they've been grossly neglected in this state. I think it's a shame." She explained her visions of riding the growth of the state's agricultural sector to develop a local market for fresh seafood. "I think we need to develop a buy-local fish program," she said. Rather than process seafood out of state, she would like to see many of those jobs in her district. "We're looking at sustainability and looking how to grow an industry and keep the jobs local," she said.